OpenHub comes with enterprise functions like an asynchronous messaging model, cluster support, its own admin console and more. OpenHub is proven, stable and has been used successfully by companies for more than 3 years. Get all the advantages of Apache Camel - open source, a big community, documentation, third-party tools … But get more with OpenHub - proven application stack, enterprise functions, extension model and more. 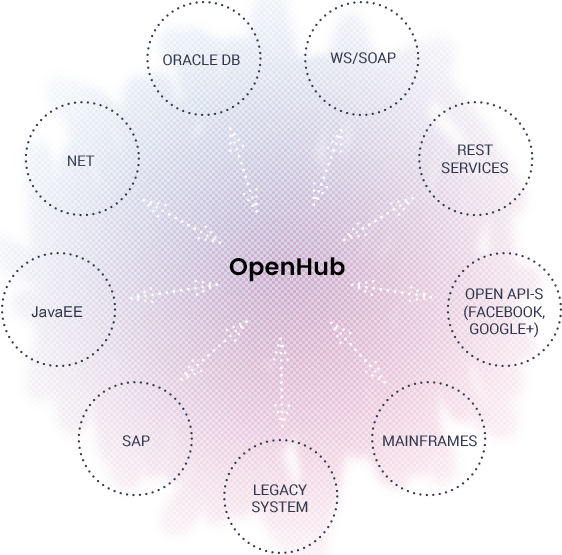 OpenHub puts together the best application libraries and frameworks and has created a proven, tested and database/application server- neutral application stack. Download it and start with integration – everything is prepared for you. Smart devs - start integrating! Problem: An electricity and gas supplier wanted to provide mobile services to its customers. So far all orders were processed manually and, there was no experience with automatic integration. The mobile service provider only used automatic B2B orders, and manual processes were not possible. Solution: The company contacted OpenWise professionals. The benefits were: favourable licence policy, speedy launch and help from OpenWise Solution experts with training, setting up basic architecture and development principles. After training their employees, the company was able to run the platform themselves. Problem: A leading Czech lottery company was about to expand into a new sphere which involved a large initial investment as well as risk of failure. Time and speed were crucial to achieve success. Solution: The initial investment was significantly decreased thanks to the open source integration platform in contrast to commercial platforms. The process of implementation was six months shorter due to ready out-of-the-box developing components for usual and non-standard developing scenarios and also all features necessary for reliable operation. Problem: An energy supplier with hundreds of thousands of customers carries out most operating processes manually. Dealing with requirements takes a long time and is prone to human error. It isn’t even possible to start self-care channels due to missing automation. Solution: Introducing an integration platform enabled the automation of most customer service processes. Data are entered only once and are transferred into other systems. Quality data enabled reliable reporting and running of the web self-care application. By doing so, a completely new selling channel was opened, which was impossible before. OpenHub is under Apache licence 2.0, open to any type of collaboration, no vendor lock-in. OpenHub is Apache Camel extended for enterprise. We've packaged Apache Camel with our extensions to create OpenHub. We've put together the best application libraries and frameworks and created a proven, tested and supported application stack. OpenHub supports asynchronous communication - automatic retry process if message fails, guaranteed message processing order, alerts and monitoring available. We can help you use OpenHub in your project and we give you support to implement your solution smoothly. We prefer open standards and protocols to proprietary solutions. OpenHub can run in high availability mode and supports running in the cluster. OpenHub is neutral to the database and application server. OpenHub supports both on-premise and cloud installations. Main system information and configuration items are all available at one place in admin GUI. And we have been using it everyday in our work. Getting started can be hard. Make it easy with support from a dev that designed the system. Cut your time on the project, avoid headscratching and get an answer in a couple of minutes. Do you need to design or review your integration architecture? Not enough developers? Or do you need to create a special feature/extension? Use our own dev team. Choose a package and we'll get the ball rolling for you, so your project is on time and within budget. Q: "It seems like quite a new solution. Has it been used before?" We released the first public version after several years of internal use. OpenHub (which initially had no name) started as a library with common functionality for our integration projects. Later, we decided to move it to the next level - the creation of a standalone framework, but still designated for internal use in our projects only. Finally, after some time we decided to make it truly public as open source and it's now called OpenHub. OpenHub (OpenHub's code to be more precise) runs in the production environments of several companies; the code has been fine-tuned through testings and production running with real integration scenarios. Q: "Is this the final version or do you plan to create additional versions?" We use OpenHub in our projects and therefore we plan to refine it and add new functionality based on our project's needs. But, our goal is to invite the community to help us with the next development. Q: "What about the quality of code and documentation?" We are trying to do our best - we use pull requests with reviews in our team, we write unit tests as reasonably as possible, we write documentation to wiki and comments to understand our code ... We want to be proud of our work and we appreciate others to use it! There are no limitations for synchronous messages - it's as fast as Apache Camel. For asynchronous messages we use a database by default for saving states - although this could be a bottleneck in some cases from a performance point of view, it still has many advantages. We’ve also added cluster support to our last version. Q: "We would like to use OpenHub/Apache Camel on our project but we don't have enough skilled people. Can you help us?" Yes, we can help you with starting your new project (review architecture, prepare project structure, create a development environment) and also help you with implementation. Please see our development packages or contact us directly. Q: "Do I need to install messaging/JMS/MQ systems to support asynchronous messaging?" We believe that every company has a database and therefore we would also like to reuse them for OpenHub. Everything that OpenHub needs to save is saved in a database - there are no limitations on the type. There is no need to adapt a new JMS/MQ system in your company to support asynchronous messaging. Apache Camel is open source project of The Apache Software Foundation. Thank you, your data was successfully submitted. Please fill in your email address. The email address is in wrong format. Please choose which developer package you want. Please fill in your email address. The email address is in the wrong format. We will contact you within one business day and discuss the details of the project. Please choose which support package you want.